COCONUT CREEK, Fla. (CNS) — With a large aging population of Catholics in many areas of the country will come an array of age-related vision complications that invariably hinder full participation in the liturgy and in spiritual life. The situation may be best addressed by readily available technology such as audio materials and large print texts especially prepared for elderly churchgoers, according to the director of the Xavier Society for the Blind. Founded in 1900, the Xavier Society was inspired by a group of dedicated laywomen aided by a priest, Jesuit Father Joseph Stadelman, who helped create what was the only Catholic publishing house to make crucial writings available to the blind. All its services were provided free of charge — a tradition that continues to the present, according to Fallon. There are some 2,400 active clients worldwide. Xavier Society for the Blind produces Braille books on spiritual and religious topics and provides Braille catechetical textbooks for students in religious education courses. Additionally, the Propers of the Sunday Mass — the Old and New Testament readings, selected prayers and responses — are available in Braille and audio. Many who receive the materials in Braille serve as lectors in their churches. Vision loss among the elderly is a major health care problem, with approximately one person in three likely to have some form of vision-reducing eye disease by the age of 65, according to the American Academy of Family Physicians. At the same time, the elderly population in the United States is increasing rapidly. By the year 2030, an estimated 70 million Americans will be over 65 years of age. Fallon said since he came on board in 2016, the society has added to the selection of Catholic books and contemporary programming available in its audio books or Braille catalogue. It recently added the Catholic Catechism in Spanish, and contemporary academic lectures from Fordham University’s Center on Religion and Culture. 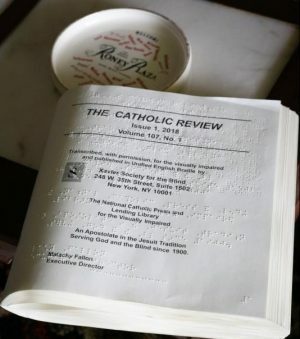 About four times a year, the Xavier Society publishes a Braille magazine, the Catholic Review, which reprints Catholic journalism articles and news from several religious publications and newspapers, including Our Sunday Visitor, the Catholic Digest, Maryknoll and the Jesuit-run America. Fallon said such updating further supports the mission to provide the word of God and the best of Catholic teaching and literature, spiritual and inspirational material, to blind and visually impaired persons of any faith and to the widest possible audience of those in need. “We also do textbooks and workbooks for kids in religious education classes, so we have a niche to serve much younger clients as well,” he noted. More about the Xavier Society can be found at its website, www.xaviersocietyfortheblind.org.